Impossible to tell apart and impossible to split up, BYU's Mitchell and Garrett Juergens walked on and found success the only way they knew how—together. PROVO, Utah — Since they were young boys in Houston, Mitchell and Garrett Juergens have wanted to do everything together. Many parents of identical twins—Garrett is older by two minutes—try to ensure that their children feel like individuals, encouraging different extra curricular activities and giving them freedom to dress however they want. Gretchen and Kurt Juergens gave up on that when their boys were toddlers. "They definitely have different personalities and we didn't treat them as the same person," Gretchen says. "If they had wanted to do things separately, we would have been in favor of that. But, well, they just did everything together." Naturally, they ended up at the same college…playing the same position…taking all the same classes…and eventually, earning the same scholarship. It sounds "crazy weird," Gretchen says, until you understand that for these BYU receivers, they really had no other choice. Following each other is all they've known their entire lives. Gretchen isn't exaggerating when she says Mitchell and Garrett were inseparable. The boys stood next to each other in the outfield and batted next to each other in the lineup during Little League baseball. In youth football they played receiver, one lining up on the right side of the field and the other on the left. In elementary school they gave in, at least a little bit, to the concept of individualism: Garrett agreed to wear black socks while Mitchell wore white. It was the only way coaches and teachers could tell them apart. Now seniors at BYU, they're convinced the coaching staff doesn't know which one is which and if they switched jerseys, no one would know. They're contemplating pulling that prank at some point this season. At Langham Creek High in Houston, they shared a white Ford F-150 pickup truck. Why buy two cars, they figured, if they were going to go to all the same places? Back in 2009, they thought that place would be Utah—as in, the University of Utah, BYU's biggest and most bitter rival. They each tallied impressive stats their senior year at Langham. Mitchell set the school's single-game receiving record with 11 catches for 223 yards and finished the season with 47 receptions for 953 yards with nine touchdowns. Garrett grabbed 45 passes for 706 yards with five touchdowns (he also nabbed an interception, making him the only twin to record a defensive stat). Both earned All-District honors. Watching their boys succeed side-by-side thrilled Gretchen and Kurt. And sometimes, it broke their hearts. "The challenge of having twins was that if both had great games, it was awesome and we could celebrate that together," Kurt says. "But then, if one of them would hit a home run and the other would strike out, or one would record 10 receptions and the other zero, it was hard to celebrate one while consoling the other. And they're very sensitive to each other's feelings, too. The first time Mitchell started at BYU, Garrett didn't, and Mitchell didn't even tell us he was starting. They never want to be boastful at the other's expense." When it came time to pick a college, Mitchell and Garrett had two criteria: They wanted to go together, and they wanted to play football. 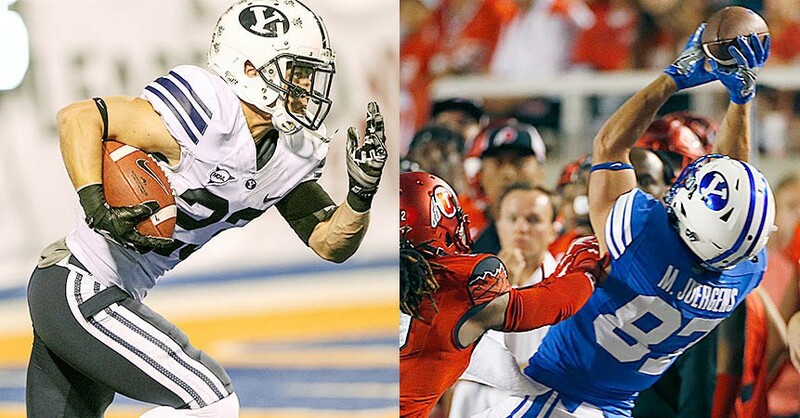 BYU was their first choice, and they never hid their desire to suit up for the Cougars. Like many members of the Church of Jesus Christ of Latter-day Saints, Mitchell and Garrett grew up rooting for BYU, the church-owned school. Their ties went deeper though. Kurt played one season at BYU, in 1981, as a kicker and punter. He left for Japan to serve his two-year LDS mission (a requirement for men in the church) after his freshman year but did not go back to football when he returned to campus. Still, he raised his boys to root for the blue, traveling to Provo so they could see their favorite team in person. At games, they wore the same gear but admit now that they had different favorite players. Garrett loved Luke Staley, a running back. Mitchell cheered loudest for Austin Collie, a former All-America wideout. 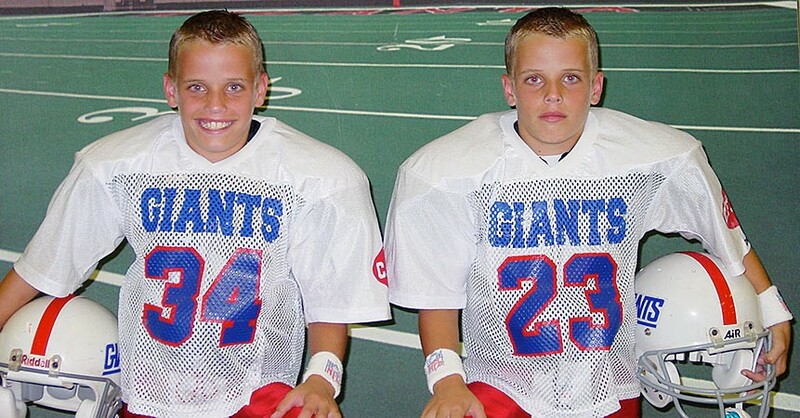 Their dream to attend BYU and play football didn't go quite as they hoped. Problem No. 1: Other college coaches knew the twins wanted to be at BYU and weren't wild about spending recruiting time and money on players who were non-committal. They received no scholarship offers together and struggled to drum up interest. Problem No. 2: BYU, then coached by Bronco Mendenhall (now in his first season at Virginia), wasn't interested. So they accepted two preferred walk-on slots at Utah. Then, right before they were set to leave in the summer of 2010, they decided they couldn't go back on a dream. They'd take a chance and go to BYU together. They'd already missed all of fall camp, but showed up for practice on the first day of school. "We were confident we could make it, but boy, it was nerve-wracking," Garrett says now. "We were standing at the bottom of the mountain, and we had a long way up." They played well enough to earn spots on the scout team, but when they left for their LDS missions—Mitchell to Mexico City and Garrett to Peru—they had no guarantee that those spots would be waiting for them when they returned. Mitchell and Garrett had other problems, though. For the first time in their life, they weren't in the same room, let alone the same country. The practice of missions (often in countries outside the United States) has been in the LDS Church for decades. They were inspired by Jesus's command in Matthew 28:19, when he said, "Go ye therefore, and teach all nations." Missionaries are paired up—they refer to each other as companions—and adhere to a strict schedule while proselytizing. A typical day for begins with 30 minutes of workout (most run and do endless amounts of push-ups and sit-ups, as exercise equipment is often not available), followed by a few hours of personal and companion study. The rest of the day is spent on service projects and proselytizing. It's natural to drop weight, especially for football players. Mitchell estimates that at one point, he trimmed his 5' 10" figure down to 150 pounds, 31 pounds less than his now-listed weight of 181. Trying to sneak in a football workout while sharing their faith doesn't work either. There's no route-running door-to-door. "There's no football where I was," Garrett says. "At least, no American football." Instead he played soccer with kids on the streets in Peru, where he reaffirmed that he's not coordinated enough to star in the world's game. Communication is limited. Missionaries are allowed to call home only on Christmas Day and Mother's Day and write letters to friends and family just once a week. But a distance of more than 2,600 miles didn't keep Mitchell and Garrett from thinking of each other. Often, when a local citizen would ask Mitchell or Garrett what they did back home, each boy would respond in the plural. "We played football, basketball and baseball." Locals were often confused. Who's we? "All their life, they were together, answering questions as a we," Kurt says. "When they were separated, that's when people knew them as individuals for the first time in their lives. They had to re-think how they described themselves, but I think they had even more love and appreciation for each other and for having a built-in best friend their entire lives." When they got home to Houston in August 2013, they skipped out on the big family reunion, instead retreating to their shared bedroom. Perplexed, Gretchen kept walking upstairs and peeking in. "Those were my boys, I missed them so much!," she says. "I wanted to see them, but first they had to have their twin time. Of course." They returned to BYU that fall, missing fall camp again, and started the walk-on process all over. "There we were," Mitchell says, "back at the bottom of the mountain." This time, they got all the way to the top. They spent 2013 on the scout team and in 2014 finally saw the field as kick and punt returners. Mitchell started every game that season, grabbing 28 receptions for 424 yards with four touchdowns, while Garrett got moved to defensive back because of depth issues. "Not playing the same position for the first time in their lives, that was really hard for them," Gretchen says. "I know it's crazy weird, but they truly are identical." During fall camp the following year, Mendenhall announced in a team meeting that Mitchell was put on scholarship. No one cheered louder than Garrett. "We had all expected it, for Mitchell to be put on scholarship and when it happened, I felt relieved, because he got what he deserved," Garrett says. "Was I jealous? No. Did I still want one for myself? Yes." In Houston, Kurt and Gretchen felt a familiar bittersweet ache. "We were so happy for Mitchell and we wanted it so badly for him. But as a mother, I believe Garrett is equal in talent and ability. Him not getting one, it just killed us," Gretchen says. "But Garrett told us, 'This is only gonna help me.'" Garrett didn't think of Mitchell's scholarship as a slight; instead he viewed it as inspiration. If his identical twin, who had been on the exact same journey, could earn a scholarship, why couldn't he be next? But it wouldn't happen in 2015, as Garrett suffered two brutal collarbone breaks. The first came on the fourth day of fall camp when he fell, and "it snapped in half." He rigorously rehabbed to get back for the Cougars' third game, at UCLA, and played in five games only to break it again. The family recalls Mitchell taking the news harder than Garrett, another example of their deep bond. When new coach Kalani Sitake arrived in 2016 to take over at his alma mater after Mendenhall's departure, Garrett viewed it as a fresh start. "I wanted to prove I was a scholarship player to the new coaches," he says. Then Mitchell chimes in: "And in summer, he did it." Sitake was surprised to learn Garrett wasn't on scholarship, and the coach was impressed by the leadership role he took on. "When we got here, he was a guy with one of the best attitudes," Sitake says. "There was no part of him that was angry he wasn't on scholarship. His twin is out on the field making plays, and this kid [Garrett] is still a bright spot in the locker room. "I mean, having one Juergens is great, but having two? That makes my job a lot easier." Sitake moved Garrett back to receiver—"his natural position," says the first-year head coach—and awarded him a scholarship before fall camp started. "When we announced it, it was one of the loudest receptions I've ever heard," Sitake says. Mitchell returned the favor to his brother from a year prior, whooping and hollering louder than anyone. When he pulled Garrett in for a hug, he whispered in his brother's ear that this time, he deserved it. They entered the 2016 season with different roles. Mitchell was one of the Cougars' top returning pass-catchers, having hauled in 37 balls for 471 yards with two touchdowns in 2015. Through BYU's first two games, he has caught eight passes for 52 yards. Garrett, finally healthy, plays a backup role. 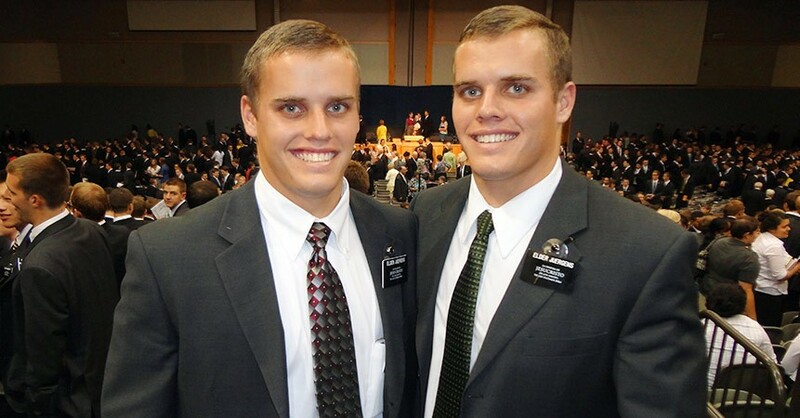 The twins are finance majors and have taken every single class together at BYU. Both are married. Garrett first saw his wife, McKenna, at a Halloween party, where she was dressed as a famous Star Wars character. The next day, he saw her sitting a few rows from him and texted his brother, "Princess Leia is in our class!" Worried that McKenna might fall for his twin, Garrett instructed Mitchell to pretend like he had a girlfriend "so I have a shot." Mitchell played along, often referencing a non-existent significant other to steer McKenna's attention back to Garrett. They got married on Dec. 6, 2014. Mitchell married this summer, and Garrett, predictably, played best man. At the reception, Garrett gave a heartfelt speech about how lucky Mitchell's wife, Shayna, was because "Mitchell was born to be a companion. He's been one his whole life. You're getting someone who already knows how to serve and put someone else first." Their shared journey makes their parents swell with pride. Senior night, they joke, is going to be doubly emotional for their family. Kurt and Gretchen often find themselves wiping away tears thinking about Mitchell and Garrett's path to recognition and how it's made sweeter by doing it together. As for the boys, well, it's more than we wouldn't want it any other way. They honestly don't know any other way. "Since we were kids, we've always thought it was cooler that we're twins," Garrett says. "We didn't just want success—we always wanted success together." Know a good walk-on story in college football? Lindsay Schnell wants to hear it. Email her at SIwalkon@gmail.com.